Step aside, Taylor Swift. Democratic presidential candidate Hillary Clinton is coming through with a "girl squad" entourage of her own. Ever since Clinton announced her candidacy, the endorsements from female celebrities have come pouring in. "Ugly Betty" star America Ferrera was one of the first to announce that she was backing Clinton. "I believed in her then, I believe her now," she wrote on Twitter , referring to Clinton's 2008 White House run. Beyoncé also backs the former U.S. secretary of state. She and her husband, rapper and businessman Jay Z, have donated to her campaign and attended a May fundraiser. Celebrity twins and actresses Mary-Kate and Ashley Olsen also have attended fundraisers for Clinton. The twins were seen at an April event. Comedian and actress Amy Poehler, who has portrayed Clinton on NBC's "Saturday Night Live," tweeted a GIF of her and the Democratic candidate together on the show. “Let’s do this. #Hillary2016 @HillaryClinton," she wrote. In an email to Clinton supporters, actress Salma Hayek wrote that she believed Clinton was the candidate who could best represent Latino voters. "I'm proud to help launch Latinos for Hillary," she wrote. Another actress pledging to stump for Clinton was "Scandal" star Kerry Washington. “I’m very thrilled. I’m excited for her, and I’m sure I’ll be hitting the stump trail,” Washington said. Katy Perry has been one of Clinton's major supporters. The "Firework" singer joined the candidate on the campaign trail, performing at a rally in Iowa last month. Ariana Grande is also a supporter. 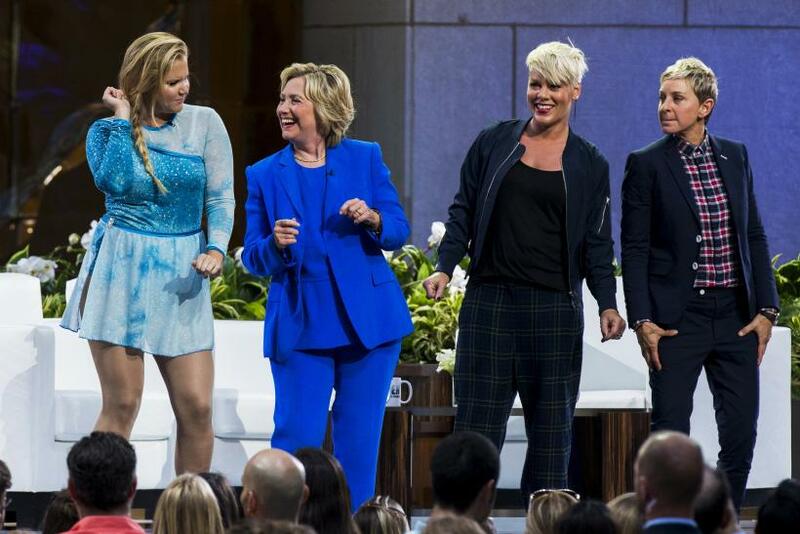 The pop star tweeted “yaaas @hillaryclinton” after Clinton’s announcement. Fellow pop star Jennifer Lopez also shared she was behind Clinton this election season. “I’m very excited by the news. I think it’s time for a woman,” Lopez told E! News at the MTV Movie Awards. One of the reigning queens of social media, Kim Kardashian West, gave Clinton her endorsement in an Instagram post. "I got my selfie!!! I really loved hearing her speak & hearing her goals for our country!#HillaryForPresident," the reality star posted in a photo with Clinton that received more than 900,000 likes. "Girls" creator and feminist Lena Dunham has also posted to Instagram in support of Clinton. “Dear Madame Secretary, this is a great excuse to tell you that I admire you, am inspired by you (especially this week when you took so much in your powerful stride) and, most importantly, I think you look great with an up do as well as a down do," she wrote on Clinton's birthday in October. Clinton appeared in an interview with the actress, where the two talked fashion, student debt and feminism. Clinton has received donations from actresses Kate Hudson, Dakota Fanning, Eva Longoria and comedian Sarah Silverman. Actress Barbra Streisand has fundraised for the Democratic front-runner. For more celebrities behind Clinton, check out a comprehensive list compiled by Marie Claire magazine.